Move on to 1968 or back to 1966. BJF, 1967, Das Ausgraben und Restaurieren Menschlischer Skelette, Der Präparator Zeitschrift, 13 (1): 106-110, January. BJF, 1967, Don't be suspicious of Computers, Voice of Welsh Industry, 7, (1): 18 et seq, January. BJF, 1967, Confusing, this change of blood, South Wales Echo: 4, 25 January. BJF, 1967 Lost opportunity [Leader Column], Voice of Welsh Industry, 7, (2): 7 February. BJF, 1967, Wales and the Squeeze, Voice of Welsh Industry, 7, (2): 9, February. BJF, 1967, History of Achievement at College, Voice of Welsh Industry, 7, (2): 10, February. BJF, 1967, Johnson and Johnson New Plant, Voice of Welsh Industry, 7, (2): 14-15, February. BJF, 1967, Mostyn Port - Outlet for North Wales, Voice of Welsh Industry, 7, (2): 18-19, Feb.
BJF, 1967, BP/Distillers Deal Creates Giant, Voice of Welsh Industry, 7, (2): 20-21, February. BJF, 1967, Precognition, Medical News, 17 February. BJF, 1967, Your Ceiling Tiles may be a Fire Risk, South Wales Echo, 17 February. BJF, 1967, The Pill, South Wales Echo, 24 February. Anon, 1967, Cartoon Comparison, South Wales Echo No. 25,871 [leader page] p6, March. Reader, 1967, No Smoker, Correspondence Column, South Wales Echo, 18 March. Catto, Alex, 1967, Design Centre for Wales [Leader Column], Voice of Welsh Industry, 7, (3): 9 March. BJF, 1967, Wales and Europe, Voice of Welsh Industry, 7, (2): 10-12, March. BJF, 1967, A statistic survey of Societies, Voice of Welsh Industry, 7, (2): 24-35, March. BJF, 1967, Tanker: A Sad story of Muddle, South Wales Echo, 27 March. BJF, 1967, We may have the Answer [to oil pollution] South Wales Echo: 1, 29 March. BJF, 1967, Whatever you May Think, Pesticides are Vital to Us, South Wales Echo, 14 April. BJF, 1967, Flying The Policy 'Kite' [leader], Voice of Welsh Industry, 7, (4): 5, April. BJF 1967, Welsh Born Executive Takes Over Skefco, Voice of Welsh Industry, 7, (4): 6-7, April. BJF 1967, Mid Wales Development, Voice of Welsh Industry, 7, (4): 14, April. BJF, 1967, Secretary of State Opens Factory, Voice of Welsh Industry, 7, (4): 15-16, April. BJF, 1967, Runcorn New Town Plan, Voice of Welsh Industry, 7, (4): 19-20, April. BJF, 1967 Severnside Development, Voice of Welsh Industry, 7, (4): 20-21, April. BJF, 1967, Packaging Standards, Voice of Welsh Industry, 7, (4): 23, April. BJF, 1967, The Future of Cwmbran, Voice of Welsh Industry, 7, (4): 24, April. BJF, 1967, Conclusion on the White Dots of Scheerer's Phenomenon, Intelligence, 99: 1. Norden, Heinz, 1967, Brian J Ford's 'Brilliant Theory', Intelligence, 99: 1 May. BJF, 1967, Alcoholism - Symptom not Disease? Medical News, ?12 May. BJF, 1967, Transport in Wales [Leader], Voice of Welsh Industry, 7, (5): 9, May. BJF, 1967, Brighter Outlook for Road Transportation, Voice of Welsh Industry, 7, (5): 10-13. BJF, 1967 A New Image For British Rail, Voice of Welsh Industry, 7, (5): 20-24, May. BJF, 1967, Tribology on Screen, Voice of Welsh Industry, 7, (5): 35, May. [Catto, Alex], 1967, Brian J Ford Appointed Editor (report with photograph), Voice of Welsh Industry, 7, (5): 36, May. BJF, 1967, Barry Experiment Offers Advance in Oil Treatment, Voice of Welsh Industry, 7, (5): 38-39, May. BJF, 1967, Cardiff Architect Wins Government Competition, Voice of Welsh Industry, 7, (5): 41, May. BJF, 1967, No: he's not the Daddy of us All, South Wales Echo, 25 May. Report, 1967, New Voice For Welsh Industry, Western Mail , 25 May. Report, 1967, BJF Appointed New Editor of Voice, South Wales Echo, 25 May. Report, 1967, [in] Notes by The Way, South Wales Argus, ?26 May. BJF, 1967, Evolution; What do the Fossils tell us? South Wales Echo: 5, ? May. BJF, 1967, On Thunder, Intelligence, 100: 7, June. 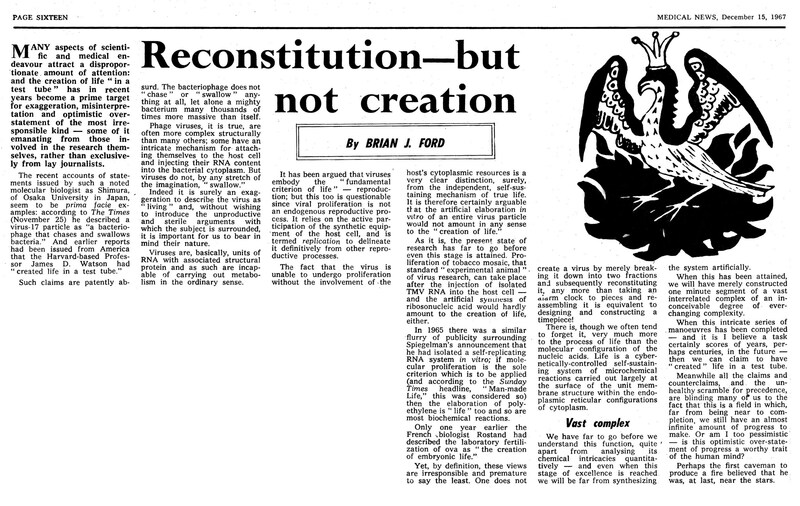 Rees, I., 1967, Creationist Theory, Correspondence Column, South Wales Echo, 6 June. Wagner, H., 1967, The Evolutionist, Correspondence Column, South Wales Echo, 8 June. Howitt, R., 1967, Is Man just a speck of Dust? South Wales Echo, 12 June. Cooney, M., 1967, Fact of evolution , Correspondence Column, South Wales Echo, 12 June. BJF, 1967, A Statement of Policy [Editorial], Voice of Welsh Industry, 7, (6): 7, June. BJF, 1967, The ultimate Cost of Industrial Safety, Voice of Welsh Industry, 7, (6): 8-9, June. BJF, 1967, Brutal Facts of Industrial Accidents, Voice of Welsh Industry, 7, (6): 11-13, June. BJF, 1967, Professional Price (anecdote), Voice of Welsh Industry, 7, (6): 21, June. BJF, 1967, No Short Cut to Cheap Gas, Voice of Welsh Industry, 7, (6): 26, June. BJF, 1967, Natural Gas Development, Voice of Welsh Industry, 7, (6): 27-28, June. BJF, 1967, Design Centre for Cardiff? Voice of Welsh Industry, 7, (6) 30, June. BJF, 1967, Man, The Tiny Speck in the Universe, South Wales Echo, 17 June. Burr, Margaret, 1967, Hay Fever is No Joke [quotes BJF], South Wales Echo, 22 June. BJF, 1967, The Vision in the Window Explained, British Journal of Photography, 114 (5580): 550-554, June. BJF, 1967, Another Sonic Boom, and Brian J Ford our Science Expert says ... South Wales Echo, 12 July. BJF, 1967, Storm-clouds Gather Over The Welsh Plan, Voice of Welsh Industry, 7, (7): 7, July. BJF, 1967, New Correspondent on Tribology, Voice of Welsh Industry, 7, (7): 14, July. Readers, 1967, Letters on the 'New' Voice, Voice of Welsh Industry, 7, (7): 24, July. BJF, 1967, Major Advance in Cement Technology, Voice of Welsh Industry, 7, (7): 31, July. [Wharton, John], 1967, Conference in London, Voice of Welsh Industry, 7, (7): 39, July. BJF, 1967, This Man o' War has a Million Broadsides, South Wales Echo, 4 August. BJF, 1967, Money Down the Drain, [Editorial], Voice of Welsh Industry, 7, (8): 7, August. BJF, 1967, Report on the Coal and Steel Community, Voice of Welsh Industry, 7, (8): 17-19, August. BJF, 1967, Selling Wales To The United States, Voice of Welsh Industry, 7, (8): 19, August. BJF, 1967, New Correspondent for Voice, Voice of Welsh Industry, 7, (8): 27, August. BJF, 1967, New Cardiff College, Voice of Welsh Industry, 7, (8): 32, August. BJF, 1967, The Tiny Spore that Threatens your Home, South Wales Echo, 17 August. Reader, 1967, Wet Rot, Correspondence Column, South Wales Echo, ?19 August. BJF, 1967, Colour T.V. and when the Novelty Wears Off, South Wales Echo, 25 August. BJF, 1967, Editorial contributions, Private Eye, ?29 August. Galpin R. E., 1967, Colour TV, Correspondence Column, South Wales Echo, 1 September. BJF, 1967, Does Nobody care about Wales? [Editorial], Voice of Welsh Industry, 7, (9): 7, September. BJF, 1967, Design Centre, the Unclear Issue, Voice of Welsh Industry, 7, (9): 14, September. Readers, 1967, Letters on Voice, Correspondence Column, Voice of Welsh Industry, 7, (9): 17, September. BJF, 1967, The Common Market and Social Policy, Voice of Welsh Industry, 7, (9): 18, September. Report, 1967, Editor visits East Germany, Voice of Welsh Industry, 7, (9): 20, September. Report, 1967, Off to the Fair, South Wales Echo, ? September. BJF, 1967, Brian J Ford Looks at Life in East Germany, South Wales Echo, 27 September. BJF, 1967, Now Action can be Taken over Drugs, South Wales Echo, 29 September. BJF, 1967, Editorial contributions, Private Eye, ?29 September. BJF, 1967, The new Dark Age: Nazi Medical Experiments, History Of The Second World War, 3, (8): 1114-1117, London: Purnell, October. Report, 1967, Brian J Ford taking part in TV Discussion, South Wales Echo, 3 October. Sithers, J., 1967, How drug research has reduced death rate, Correspondence Column, South Wales Echo, 9 October. BJF, 1967, Un Nuovo Oscuro Medioevo, [Translation of New Dark Age, q.v.,] Storia della Seconda Guerra Mondiale, 40: 262-265, Milan: Rizzoli, October. BJF, 1967, Brian J Ford Investigates a 12th Century Murder, Medical News, 262: 10, 13 October. BJF, 1967, Cooking up a Menu, Voice of Welsh Industry, 7, (10): 13-14 October. BJF, 1967, Is This The Future For Europe? Voice of Welsh Industry, 7, (10): 15, October. Readers, 1967, Correspondence Column, Voice of Welsh Industry, 7, (10): 27 October. BJF, 1967, Leipzig Fair - But Where Was Wales? Voice of Welsh Industry, 7, (10): 29 Oct.
BJF, 1967, Strangled By The System, Voice of Welsh Industry, 7, (11): 11, November. BJF, 1967, Asking Questions in a Communist State, Voice of Welsh Industry, 7, (11): 12-13, November. BJF, 1967, One more Step towards a Design Centre, Voice of Welsh Industry, 7, (11): 13, November. BJF, 1967, Small Firms can Lead the Field, Voice of Welsh Industry, 7, (11): 15, November. Readers, 1967, Letters to the Editor, Correspondence Column, Voice of Welsh Industry, 7, (11): 24-25, November. BJF, 1967, The Welsh Breathalyser, Voice of Welsh Industry, 7, (11): 30, November. BJF, 1967, An Infra-red Eye on South Wales, Voice of Welsh Industry, 7, (11): 35, November. BJF, 1967, Let's end this Mediaeval Folly [foot & mouth disease], South Wales Echo, 1 December. BJF, 1967, New Hearts for Old - Still a Long Way to Go, South Wales Echo, 7 December. Ryland, D. N., 1967, Letter on Foot & Mouth Disease, Correspondence Column, South Wales Echo, 12 December. BJF, 1967, Foot & Mouth (reply), Correspondence Column, South Wales Echo, 12 December. BJF, 1967, Reconstitution, but not Creation (of viruses), Medical News: 16, 15 December. BJF, 1967, Wales needs her young Prince, [Editorial], Voice of Welsh Industry, 7, (12): 9, December. BJF, 1967, Pioneer of Industrial reporting, Voice of Welsh Industry, 7, (12): 26-27, December. Sims, J., 1967, Germany's Medical Experiments, Letter, History Of The Second World War, 4, (3): iv, London: Purnell, December. BJF, 1967, Medical Experimentation (author's reply), History Of The Second World War, 4, (3): iv, London: Purnell, December. BJF (editor), 1967, Science Diary, 128pp, 2nd edition for 1968, London: Letts, December. BJF, 1967, Dates and Data to Remember, [Reviews Science Diary], South Wales Echo, 29 December.